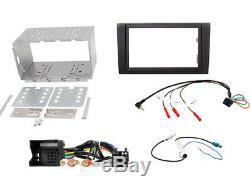 Panel frame set 2 double din audi a4 b7 05 to 07 con. This product page has been automatically translated. If you have any questions, do not hesitate to contact us. Descrizione del prodotto winding weft, two pairs of fixing springs, screws, profile cover custom frame for cars below: audi a4 from 2005 to 2007 also contains unlocking keys for monitors, navigators, hot double din fixing cage bore mm 182 x 103 (metal hole measurement) remote steering wheel interface kit, which recovers amplification (the new car must have 4 preamp outputs) and the antenna connection. Compatible for all brands of car radio. Gm-2275-709 + tt + 166eco + ad . To have an extra discount! After we have received and verified your purchase is a good idea to take out one. Stars of positive feedback 5. Very important are the stars of the note, remember that the selection of less than 5 stars implies degrades quality providers. The odds reflect the seriousness of the seller, use them wisely. Avoid leaving negative or neutral feedback, please contact us immediately in case of any problem, we are always ready to resolve them with maximum availability, reliability and in the shortest possible time. Each product purchased, in case of used waste encountered, it can be done and replaced by an identical. If the product is damaged, broken or tampered with to return the order verifies the current state of the product and replaced in case of integrity and sent in the state of cut or tampered with denneggiato if you can not restore to cause of you / user. Returns must be sent to g. Rimembrazne boulevard, suite 3-20099 93 production s. Upon receipt of the returned item, we will contact you to complete the practice. We issue invoices only by surmounting with only value products I 30eur, below this threshold, bill is still can be waived by a mandatory contribution 5.16 euros options to add to the total cost of purchase. The item "2 din din set frame panel audi a4 b7 05 a 07 con" is on sale since Sunday, March 11, 2018. It is in the category "auto, moto parts, accessories \ car radios, hi-fi, video, gps \other". The seller is "g_m_production" and is located in / sesto san giovanni. This item can be delivered anywhere in the world.